Recovering from an injury can be difficult. For many people, the process of regaining their health takes a long time and involves many different physical and emotional challenges. While some are able to fully recover from an injury in a matter of weeks or months, others are left with permanent issues such as problems with mobility, concentration, or chronic pain that affect the way they live their lives. Even people who are able to fully regain the physical health they had before an accident are often left with severe emotional issues like anxiety or post-traumatic stress disorder. The process of recovery looks different for everybody, but there are some key ways that people can help themselves heal and cope with their trauma. This page contains useful information for people wondering how they will be able to handle recovering from a serious accident injury. If you have been injured in an accident, the most important thing you can do is seek care from a medical professional. Often, this will be obvious. However, many people walk away from accidents with trauma that they are unaware of such as herniated discs, traumatic brain injuries, or damage to the ligaments in their shoulders or knees. Leaving these injuries untreated often makes them worse and even more difficult to recover from. According to Julie K. Silver M.D., a nationally recognized doctor in physical medicine and rehabilitation and an affiliate of Harvard Medical School, losing sleep can harm the recovery process. Typically, people need about seven or eight hours of sleep every night to be healthy. However, with an illness or serious injury, the body can require more than the normal amount of rest. According to Silver, some important healing processes require sleep to function. A study presented at the 5th World Congress on Sleep Medicine in October 2013 shows that sleep deprivation actually impairs muscle recovery after injuries. While it is essential to get enough rest while you are recovering, injuries can make it difficult to sleep. Many people have issues with sleeping because of pain from their injury. Others are unable to sleep because they are worried about their condition or have anxiety related to the traumatic event that caused their injury. Dealing with these issues can sometimes be as simple as drinking less coffee or adhering to a regular sleep schedule. However, some people need medications to help them get enough rest. Be sure that you speak with your doctor before taking any sleep aids, even if they are over-the-counter medications, as they may interfere with your recovery. While you are recovering, it is essential to keep your body healthy and to get all the nutrients you need for general health. However, worrying about getting the exact amount of recommended calories, vitamins, protein, and other nutrients can cause undue stress. This can, in turn, hamper your healing process. People who are going through the process of recovering from an injury should do their best to eat well without following extreme diets or causing themselves stress or discomfort. A handy way to see if you are getting the nutrients you need is to look at these healthy eating guidelines from the USDA and see how your habits match up. Keep in mind that these guidelines are just a general tool and that you should ask your doctor for specific advice about how you can improve your diet. In addition to eating for general health, the Academy of Nutrition and Dietetics advises that people recovering from injuries focus on eating enough protein, Vitamin C, Zinc, Vitamin D, and Calcium. For people on pain medications, it is also important to eat foods with a lot of fiber. This can help combat constipation commonly caused by these medicines. Finally, be aware that many people make claims about the healing properties of different foods. Be careful that you only follow advice from medical professionals and know about the FDA’s review system for food-based health claims. Spend time with your loved ones: Injured people often want to isolate themselves to deal with their emotions. While it can be helpful to have time to yourself, it’s important to spend time with the people who care about you. Manage Stress: As mentioned above, stress makes it more difficult for the body to heal. Learning stress-coping strategies such as relaxation techniques, deep breathing exercises, and meditation may seem cliche, but helps many people manage their stress levels. Seek Help: People sometimes try to hide their emotional problems. However, being open about your issues is essential, especially when speaking with your doctor. Make sure that your doctor knows if you are feeling severe depression, anxiety, or are having other emotional problems. Your doctor may recommend that you speak with a therapist, take medication, or join a support group. Be Patient: Learning to cope with an injury is a long-term process. Don’t worry if you are not able to adjust right away and recognize that not all recovery strategies will work for everybody. Recovery is important, but many people are unsure of how they will be able to pay for surgeries, therapy, in-home care, and other necessary costs. This can be especially difficult when injuries leave people unable to work, and a source of income is suddenly lost. A large number of accident injuries are caused by negligence. 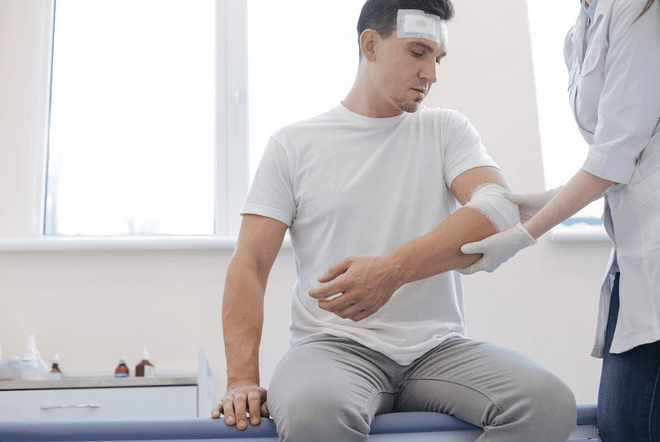 In these circumstances, injured people can often hold negligent parties responsible for paying for the emotional and physical damages the accident caused. These damages can be recovered through personal injury claims. Fresno City College Disabled Students Program and Services - Students at Fresno City College with brain injuries, mobility issues, audio or visual impairments, or other health conditions can receive assistance through this program. Fixed Route and Handy Ride Busses - People who need help getting from place to place can make use of Fresno’s free public transit facilities including mobility device marking and tethering and other accommodations. People living outside the city can get access to cost-effective transportation options from the Fresno Rural Transit Agency. People interested in work programs, travel training, peer support groups, consumer advocacy, and more for people with injury-related disabilities can check out the Resources for Independence Central Valley, a group dedicated to helping people with disabilities live independent lives. I’m Ed Smith, a Fresno personal injury lawyer. If your life has been affected by an accident injury, call me to get free, friendly advice regarding the legal options that may be available to you. I can be reached at (559) 377-7676. If you are calling from outside the area, feel free to use (800) 404-5400. I am a member of the Million Dollar Advocates, a forum for trial lawyers who’ve won verdicts or settlements worth more than $1 million. I’m also a part of the National Association of Distinguished Counsel, an organization which recognizes the top one percent of attorneys nationwide who have exhibited legal excellence.